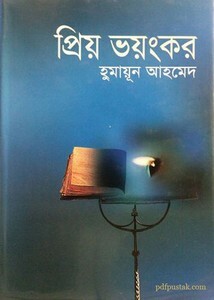 Priyo Bhoyankar by Humayun Ahmed bangla boi pdf file. 'Priyo Bhoyankar' is a stories collection Bangla boi which is written by the very well known and famous Bangladeshi author and filmmaker Humayun Ahmed. This collection have seven novels and eight short stories, these are Novels: Jokhan Giyechhe Dube Panchamir Chand, Poka, The Exorsist, Aynaghor, Ami Ebong Amra, Debi, Parul ebong Tinti Kukur. Short Stories: Kukur, Bhoy, Shobjatra, Chhayasangi, Ayana, Jwin-Kafin, Dwitiya Jon, Se. The ebook pdf has 173 pages 12mb size.